LAST CHANCE TO SEE THIS EXHIBITION! 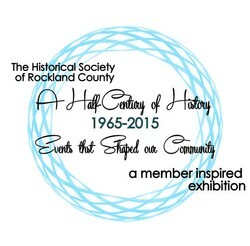 The year 2015 marks the 50th anniversary of the HSRC’s charter, the result of the consolidation of the Tappan Zee Historical Society and the Rockland County Historical Society. The announcement of the merger took place in 1964 and was finalized by the issuance of the Charter by the New York State Board of Regents on September 2, 1965. In celebration of this important milestone, we asked members to share their thoughts on the most formative events of the past 50 years. The responses inspired us to prepare an exhibition that focuses on events that have shaped our community. Changes to the landscape, demographics, our government and more are illustrated using items from the HSRC’s permanent collection and on loan from members, friends, and supporters of the HSRC. We thank our members for their feedback and input. The HSRC will be closed weekends in November as we install the 40th Annual Holiday Exhibition, opening December 5-6 during our annual St. Nicholas Day Festival and open Wednesdays-Sundays, 12-4 pm, through mid-January.